VISALIA – A Redwood High School senior was arrested Monday for writing that he would “kill as many people as possible” on the bathroom wall if the school was not evacuated on Feb. 5. At 5:30 p.m. on Feb. 4, Redwood High School issued a statement that an administrator received information regarding a threat of gun violence at the school. Two students entered a boy’s bathroom on the high school campus at about 2:30 p.m. and found the following statement written on wall: “If school isn’t evacuated tomorrow I will bring a gun and kill as many people as possible 2/4/18”. According to the Visalia Police Deparment, the administrator contacted the school resource officer (SRO) who began to investigate who might have written the statement. While viewing surveillance video, the SRO observed a student entering and leaving the bathroom where the message was left. The student, only identified as an 18-year-old white male, was brought into the office where he admitted to writing the threat. The student was arrested for terrorist threats and booked at the Tulare County Pre-Trial Facility. 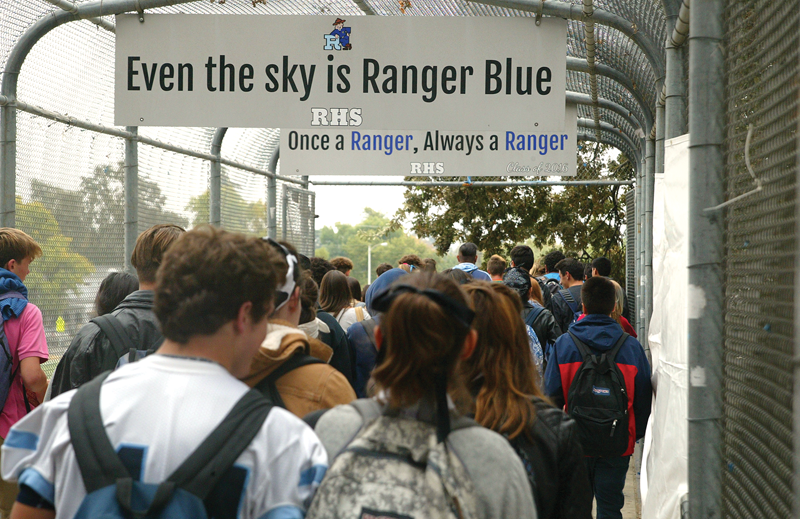 “The safety and well-being of students and staff are the highest level of priority of Redwood High School and Visalia Unified School District,” wrote Dr. Tamara Ravalin, assistant superintendent of human resources at Visalia Unified School District (VUSD). The threat and arrest came just four days after a similar threat was made. At about 11:30 a.m. on Jan. 31, Redwood administrators were informed of a possible threat to its Academic Building on campus that was posted on a bathroom wall. That message listed the day of the potential incident as Feb. 4. Before school on Monday, officers conducted another search of the campus and the Academic Building to ensure the safety of all Redwood students and staff. Officers determined that the campus was safe and school was able to follow the regular schedule. Ravalin reminded the public that every Visalia Unified school has established a safety plan which contributes to maintaining a safe learning environment for students. Visalia Unified School District continues to review plans and continues an ongoing relationship with law enforcement to ensure everything possible is done to maintain the safety and security of Redwood High School and all schools in the District. “Visalia Unified School District is grateful to the Visalia Police Department for the professional response and on-going diligence to protect students,” Dr. Ravalin wrote to conclude the statement.